10 year Guarantee (excudes condensation and infestation remedial work). 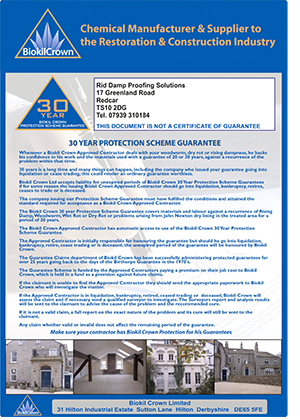 Our standard guarantee on damp proofing remedial work is 10 years. This includes injection work and tanking (membrane system). Please note our ten year guarantee does not cover condensation work, as many different factors out of our control, can affect condensation. Return of damp to areas where we have completed work. 30 Year Guarentee (excudes condensation and infestation remedial work). We also offer a 30 year guarantee linked to our suppliers, Biokil Crown. You'll get all the benefits of our 10 year guarantee plus the added security that if we have gone out of business for any reason, the Biokil Crown 30 year protection guarentee scheme will honour any guarantee outstanding. For this guarantee to be used we must use materials supplied through Biokil Crown and a further 5% premium is added to the cost of the job, this premium is then paid to Biokil Crown who will then back up the guarantee should we have gone out of business during the remainder of the guarantee. Guarantee is still available through Biokil Crown Protection Scheme Guarantee if we have gone out of business for any reason. For more info on this guarentee, download the Biokil Crown documentation here or click on the image below. RID - Approved Biokil Crown contractor.